Our pets can be our best friends, which is why we want them to be there for all of life’s magical adventures! That’s also why it can be so concerning if your pet has an illness. 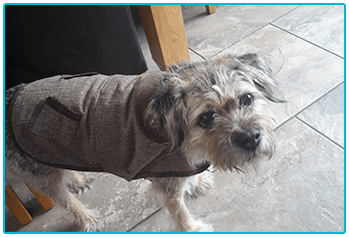 Sadly, the Sandbach family’s Border Terrier dog, Blue, had been unwell since November 2018. 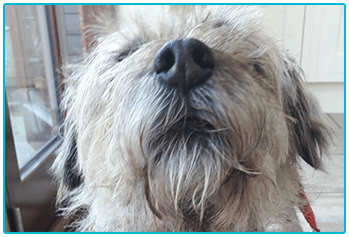 We spoke to Blue’s owner, Gareth, about the illness, getting a diagnosis and keeping on top of vet’s fees. Read on to hear their story. 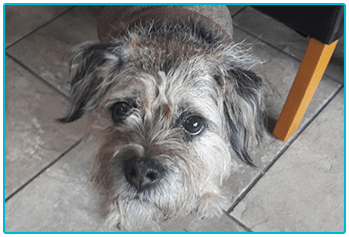 Blue the Border Terrier, has been the much-loved Sandbach family dog ever since they bought him as a puppy in 2006. Gareth describes him as a “placid, healthy, faithful dog with a great character”. Although, to the confusion of the family, whilst Blue’s usually super-friendly, he takes a particular dislike to Border Collies. Each to their own! Gareth and the family first noticed something was wrong when Blue’s “drinking and urinating was becoming excessive”. He was also “having accidents in the house, which was out of character.” Naturally, as a concerned pet parent, Gareth immediately took Blue to their vet to find out what could be wrong. Blue skies over the horizon? The Sandbachs are still trying to reach that hard-to-find diagnosis for Blue. But in the meantime, while he’s not his old self, he’s “managing quite well with all the investigations and his condition.” Blue’s also been receiving extra special attention from Gareth’s youngest two children, who’ve really been spoiling him! We wish Gareth, Blue and their family well. Hopefully they’ll manage to work with their vet to find out just what’s wrong with their treasured pet and get him back into top condition!